There are few places in the world where an awe-inspiring, 122-foot-long dinosaur greets visitors as they exit the elevators. Marvels like this are typically created by museums dedicated to natural history. The multi-media exhibits and scientific collections in these types of venues help visitors understand and interpret what life was like when a plant-eating Titanosaur, a reptile that stood more than 19-feet high, roamed the earth. When the American Museum of Natural History (AMNH) recently opened the Titanosaur permanent exhibit, it became one of the numerous permanent, special, live-animal, temporary and/or traveling exhibitions AMNH unveils in any given year. The ability to add to the museum's 45 permanent galleries is part of its effort - common among many top-tier museums throughtout the world - to ensure that what is viewed by visitors is novel and relevant. It's also what helps to attract nearly five million visitors annually to the museum, which is located in New York City. Like any business, AMNH's budget is expected to support its operations, programs, capital improvements and endowments. Anything extra - such as special exhibitions like "The Power of Poison," live performances and/or interactive apps that engage visitors - are often made possible through contributions and grants from private and public supporters. The ability to find those sources is where the museum's development office comes into play. Most large institutions have development offices. Besides direct fundraising, the people in this area also deal with data, conduct research, record gifts, help manage events and work with donors. Depending on the donor, sometimes the money is slated for a certain area, such as scientific research and eduction. Other times, the donor's funds support an exhibition, collection or artifact. At the AMNH, some donors like to be recognized for their contribution, or they want to memorialize themselves or someone else. In those situations, signage is often created. The American Museum of Natural History has unique needs when it comes to the signage it creates, says Toni Gabor, production manager for exhibition graphics at AMNH. "The materials we use need to be robust for our visitors," she says. "The plaques are often reachable in the areas where they are displayed, for instance, on the bottom half of walls and near rails, so they are frequently subjected to bumps, rubs, abrasion, scratches, and even graffiti." Durability and cleanability, as well as readability, are key concerns since millions of visitors come to AMNH each year. Additionally,the ability to customize each sign specific to the donor, including the size used to accommodate the length of message, is another factor in AMNH's decision-making. "The materials we use need to be robust for our visitors." Engraved and printed plastic have proven to lack longevity since both get beat up pretty quickly, so the museum requests Metalphoto® photosensitive anodized aluminum for its donor plaques. The graphics reside beneath a virtually impenetrable protective surface, offering superior resistance against abrasion, fading, and graffiti while retaining crisp graphics and copy. AMNH has trusted Metalphoto of Cincinnati for more than 10 years for solutions to their identification needs. "We like MPC," Gabor says. "Their product is durable and it's offered at a good price." As museums such as AMNH continue to showcase human cultures, the natural world and the universe for future generations, private and public donors are an important part of keeping the legacy going. 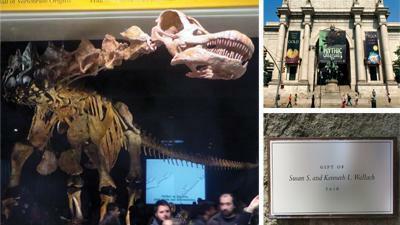 At the 147-year-old AMNH, the donor plaques and signs made by MPC will be around for decades to come.